Simply Sliding Wardrobes have been designing, manufacturing and installing custom made sliding wardrobes for years. We are based in Kent, but that doesn’t mean we only cover that particular area. We also operate in West Sussex. Our practice of working with the customer comes down to what the customer wants from their wardrobe. The choice is yours, the colour, the interior, the glass type, are all down to you. Our wardrobes are designed with you, for you. 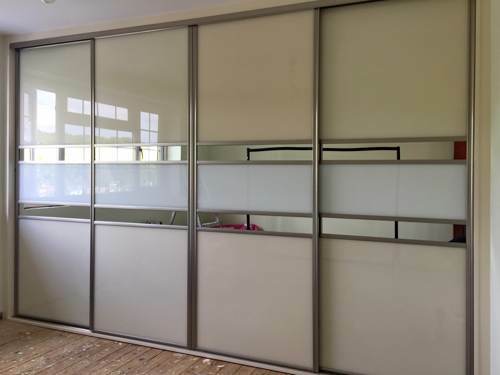 How We Work – Fitting Sliding Wardrobes in West Sussex. Take measurements of the room where your sliding wardrobe will be installed. Discuss the properties of the wardrobes’ interior. Present our samples of materials for you to choose from, these include frames, board, glass types, shades and colours. Work out clear pricing for your sliding wardrobe, including installation VAT. We understand different people work to different timescales. Contact us when you’re ready to book your installation date. Once an installation date is sorted, our team get to work as quickly as they can installing your made-to-measure sliding wardrobe. Simply Sliding Wardrobes only covers certain areas of West Sussex, including Worthing, Orsham, Crawley, and Hayward’s Heath. Quite simply if you’re looking for a sliding wardrobe company in Kent, we’ll have no problem getting to you and working with you to create your ideal wardrobe. Why Choose Simply Sliding Wardrobes? Our Experience ​​- Our team have years of experience in creating and installing custom sliding wardrobes. We know the process from back to front and create excellent sliding wardrobes for even the most difficult spaces. Style​​ – We offer a fantastic range of styles. Traditional, contemporary, made to measure, bespoke to name a few examples. Quality​​ – Our sliding door systems’ interior and exterior materials are top quality including strength and durability. Choice​​ – We have a wide range of colours, materials, and accessories to suit the tastes of everyone, with almost every element of the wardrobe being customisable to suit your requirements. Value​​ – Our customers’ needs come first every time. The real value is in the product and service you receive, meaning we are great value for money, with pricing options that can make the most of your budget. 10 Year Guarantee​​ – We offer a 10 Year Guarantee for all of our sliding wardrobes, this guarantees that our top quality wardrobes will last for at least up to 10 years. 5 Star Customer Reviews​​ – Take a look at our Checkatrade and Facebook ​pages for some of the excellent reviews from our customers. To get in touch, simply submit an enquiry either through our contact us page or give us a call today on 0800 313 4681. Alternatively, you could send us a message on our Facebook page, and we will be happy to help!